Everyone gets so freaked out about their Thanksgiving turkey. Fresh or frozen? How many pounds? To brine or not to brine? How long to cook? Stuff it or not? How often should it be basted? Stop, take a deep breath. I’ve got you covered. Think of your turkey as just a big chicken. Roasting a chicken is easy and this will be too. Promise! Ok, question 1, fresh or frozen? I prefer fresh simply because it takes out the step of thawing (yes, taste is better, but a frozen bird will taste great too). Make sure to call up your butcher or grocery store and reserve your fresh turkey now. If you’re going frozen, go ahead and purchase it (provided you have enough room in your freezer). Count on ½ pound turkey per person. Tip: I think once you get past 16 pounds, you’re better off doing a whole turkey plus a turkey breast. When the bird is much larger than that, it takes too long to cook and can be a bit uneven. I cook the breast the day before and reheat it with chicken stock to prevent it from drying out. For a 12 to 16 pound turkey, you will need to allow 3 to 4 days to thaw in the refrigerator. Your turkey should be completely thawed by Tuesday or Wednesday to allow time to dry brine before roasting. Which brings us to brining… I am not a fan of a wet brine. I think it’s messy and just adds an unnecessary element of stress. I do like a dry brine. A dry brine is just a salt mixture that is used to season the inside and outside of the turkey 24-48 hours before cooking time. (I use 3 tablespoons kosher salt, 1 teaspoon garlic powder, 1 teaspoon onion powder, and 1 teaspoon pepper. Mix it all together.) Season the turkey with this mixture and put it on a sheet pan, cover in plastic wrap, and refrigerate. When it’s 8 to 10 hours before cooking time (before you go to bed on Wednesday night), remove the plastic and continue to refrigerate. This will help the skin dry out and give you a nice crispy skin. One and a half hours before cooking time, take the turkey out of the fridge, put the herb butter under the skin, stuff it with an onion, etc, truss the legs. 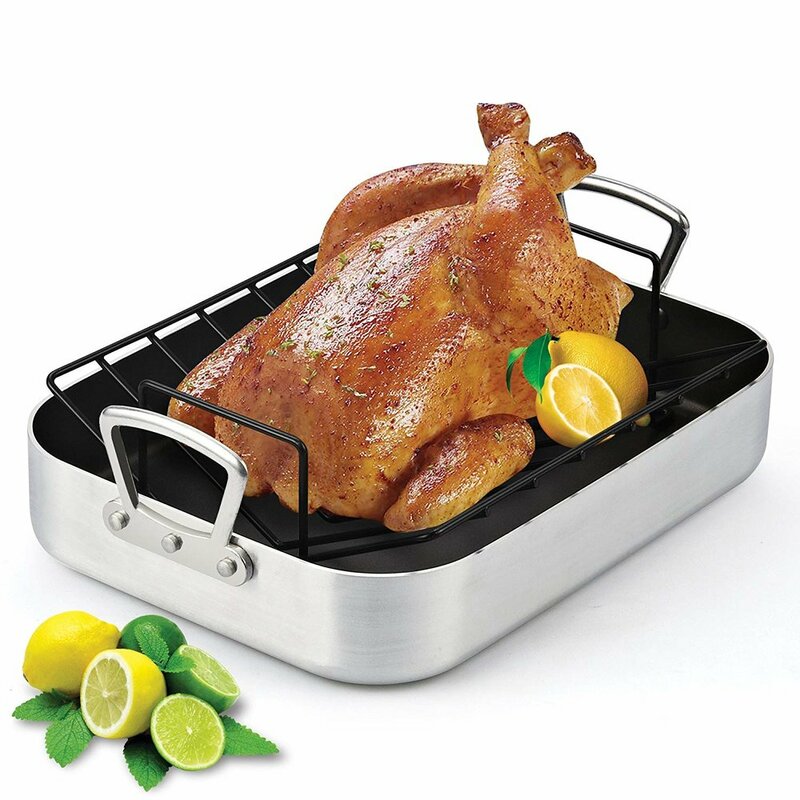 Place it into a roasting pan on a roasting rack. Tip: if you don't have a roasting rack, twist a piece of aluminum foil into an S shape and set the turkey on top of it. You can use a disposable pan from the grocery store as well. Let it stand at room temperature for 1 hour. This helps the bird’s temperature come up a bit before it goes into the oven and give more even cooking. Your turkey will need to cook approximately15 to 20 minutes per pound at 350 F, until a meat thermometer reaches 165 F. I like to baste my turkey every 30 minutes. This is a crucial step -- Tent the turkey with foil and let it stand for 45 minutes to 1 hour after it comes out of the oven. 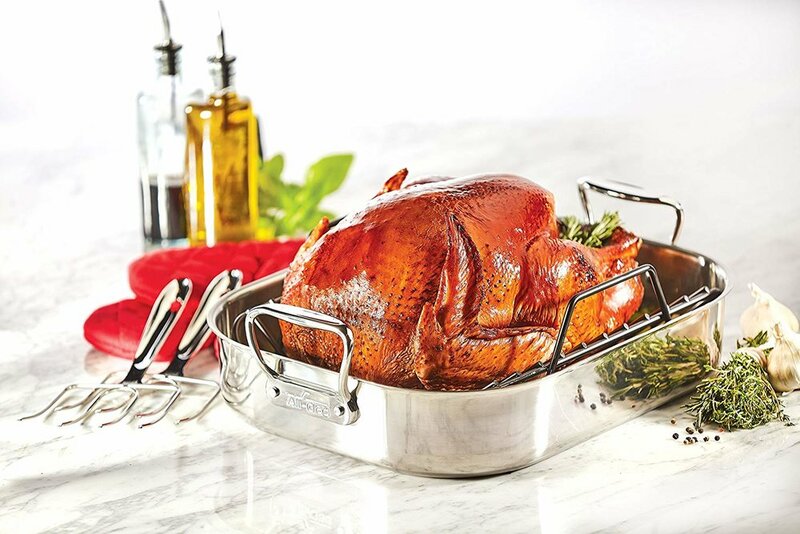 This allows the juices to redistribute so your turkey isn’t dry and will make carving much less messy as well. While the turkey is resting, you can use the oven to bake your side dishes. Friday or Saturday: If your bird is frozen, put it in the fridge to thaw. Tuesday: Dry brine the bird. Wednesday night before bed: Remove the plastic from the bird. Thursday: Allow a half hour to prep the bird, an hour for it to stand at room temperature, approximately 3 ½ hours to cook, and an hour to stand before carving. That’s not so hard, right? !